DRIVER : FP6 EC Specific Targeted Research Project (Grant agreement: IST-034047, Call: FP6-2005-IST-5 - 2.5.6.3 “Research Networking Testbeds”). 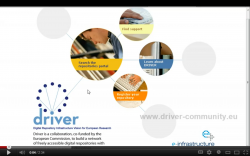 DRIVER is a multi-phase effort whose vision and primary objective is to establish a cohesive, pan-European infrastructure of Digital Repositories, offering sophisticated functionality services to both researchers and the general public. It sets out to build an advanced infrastructure for the future knowledge of the European Research Area. Aimed to be complimentary to GEANT2, the successful infrastructure for computing resources, data storage and data transport, DRIVER will deliver the content resources, i.e. any form of scientific output, including scientific/technical reports, working papers, pre-prints, articles and original research data. The vision is to establish the successful interoperation of both data network and knowledge repositories as integral parts of the E-infrastructure for research and education in Europe. With the end of the first stage of DRIVER in November 2007, a test-bed system was delivered which produced a search portal with Open Access content from over 70 repositories while it focussed on the infrastructure aspect, i.e., open, clearly defined interfaces to the content network, which allow any qualified service-provider to build services on top of it.